Get a better deal on work comp with Applied Underwriters Insurance. Get Workers Comp Coverage From Applied Underwriters. Applied Underwriters is one of the most unique workers compensation programs available today for mid-sized and large employers. They offer a blend of a Retro style program combined with a self-insured captive program. Safety conscious organizations have a significant potential to save a significant amount of money compared to traditional First Dollar coverage options. Applied also offers a 3 year rate lock on class code rating which improves predictability. Applied Underwriters Equity One program offers the same cost containment of a Retro Plan alongside the cash flow incentives of a guaranteed cost plan. Large companies are still able to share the risk/rewards of self-insuring claims without having to set aside a great deal of capital in reserves. The plan gives employers the opportunity to see significant savings over traditional guaranteed cost programs on the market. But the still minimize the risk required by each employer. Our agency works with Applied Underwriters throughout the United States to offer their unique approach to underwriting and pricing workers compensation for employers with premium greater than $250,000.00 per year. Applied Underwriters stakes its profitability on claims management. Since the insured is sharing in the profit and risk of each claim, Applied can only be profitable when they effectively managing claims in conjunction with their customers. 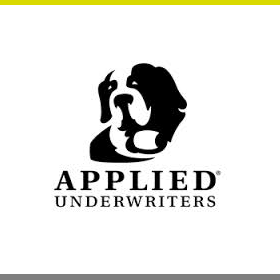 Applied Underwriters is a premier workers compensation carrier. Start a free Applied Underwriters quote today. Applied Underwriters and Equity One Comp programs are available in all states except OH, ND, WA, and WY. Call us today at (888) 611-7467 for a free, no-obligation Applied Underwriters Insurance Quote. Shop your work comp with Applied UW. At Workers Compensation Shop.com, we've partnered with Applied Underwriters Insurance Company and other national insurance companies to help employers find the best approach to pricing and managing their workers compensation insurance. Applied is an excellent option for larger premiums with above average loss ratios. Get started online with quotes from Applied Underwriters Insurance Company and some of our other insurance partners. Or give us a call today at 888-611-7467 to find out if you qualify for the Equity One comp program.